Using Storyboard can lead to complex merge conflict if there are multiple people working on the same project! Making UI in code makes the UI hard to visualize, you would need to build and run the app every time to see how the UI looks like and this is time consuming. These points are all valid and there's no point to persuade the opponent as there's merit in both approach. The practical answer to "Do UI in Storyboard or code?" is to learn both of them. Some company might list ability to do UI in code in their job requirement, if you are planning to apply for an iOS dev job, it is best to learn doing UI in both storyboard and code to increase your job prospects. In this post, we will learn how to create UILabel / UIImageView / UIButton in code and also create IBAction for UIButton. Part 2 of this post will cover how to create Auto Layout constraint in code. The label's position and size is following the frame value we coded earlier, x: 50 (50pt from left of the root view), y: 50 (50pt from top of the root view), width: 100 (100pt as width), height: 30 (30pt as height). You can check out iOSFonts.com for the list of fonts available to use in iOS. 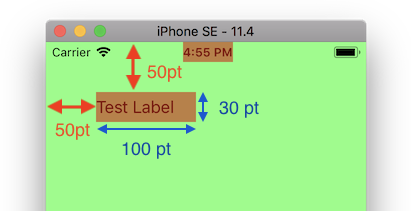 To use the system font, you can use UIFont.systemFont(ofSize:) . 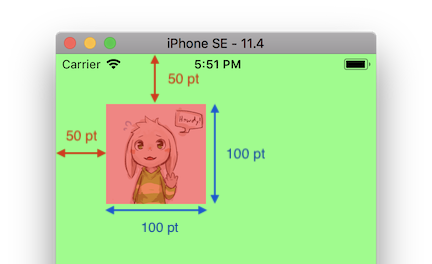 Similar to UILabel, we can create an UIImageView object in the viewDidLoad function. We will be using an image named 'asriel' in the Assets.xcassets folder for the image view. You can check Apple's documentation on UIImageView for a list of attributes you can customize for UIImageView. You know the drill now, we are going to create an UIButton object in the viewDidLoad function. UIButton is a bit more complex as it have a .titleLabel element which store the text for the button. 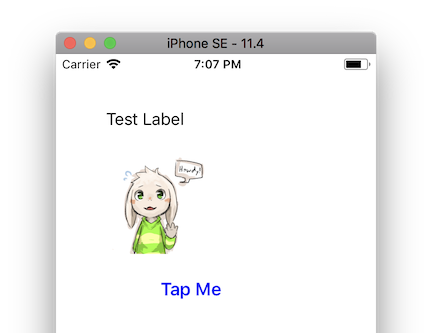 Setting the text directly using button.titleLabel?.text = "tap me" somehow doesn't work, you will need to call the setTitle(, for:) function in order to set text for the button. Same goes to the text color as well. We will need to manually add the function that will be executed when the button is tapped (@IBAction func buttonTapped), this is similar to when you control + drag the UIButton to the view controller and select action. The self in the code .addTarget(self, action: #selector(buttonTapped(_:)) refer to the controller itself, which mean that the ViewController.buttonTapped() function will be executed when user tap the button and release finger within the button area. Since Target-Action pattern relies on Objective-C, normally you would need to add @objc in front of the buttonTapped function in order to use the #selector() function in Swift. If you add @IBAction in front of the function, Swift compiler knows that this function relies on Objective-C automatically, hence you wont need to put @objc in front of @IBAction. Pretty neat right? Now you can create UI Elements in code just like how you drag-and-drop in the Storyboard / Interface Builder. This process is similar for other UI Elements as well, like UISwitch, UISegmentedControl etc. You can google keywords like "UISwitch swift programmatically" if you want to know how to create UISwitch using code etc. Since we used the .frame property to set the position and size of the UI element in this post, its position/size is fixed regardless of device screen size and orientation. We will explain more on how to create Auto Layout constraints for these UI element in code in part 2. One of the important thing to take note when using the frame property is that the x , y used in the frame is relative to its superview. 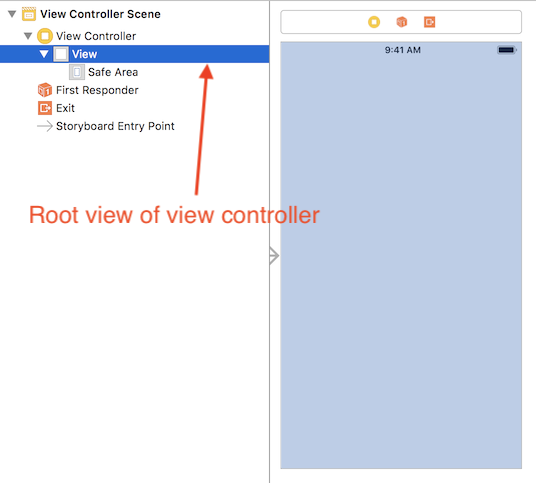 Notice that the parent view (superview) of the label is greenView, and the parent view (superview) of greenView is the view controller's root view. Notice that the x: 50 and y: 50 for the greenView is measured from the top and left of the root view. Whereas the x: 50 and y: 50 for the label is measured from the top and left of the greenView. 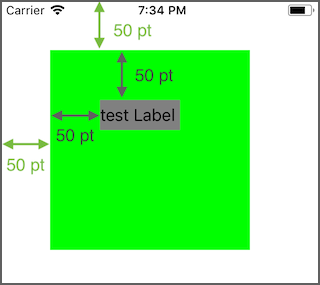 The x, y in a frame of an UI element is measured from its parent view. 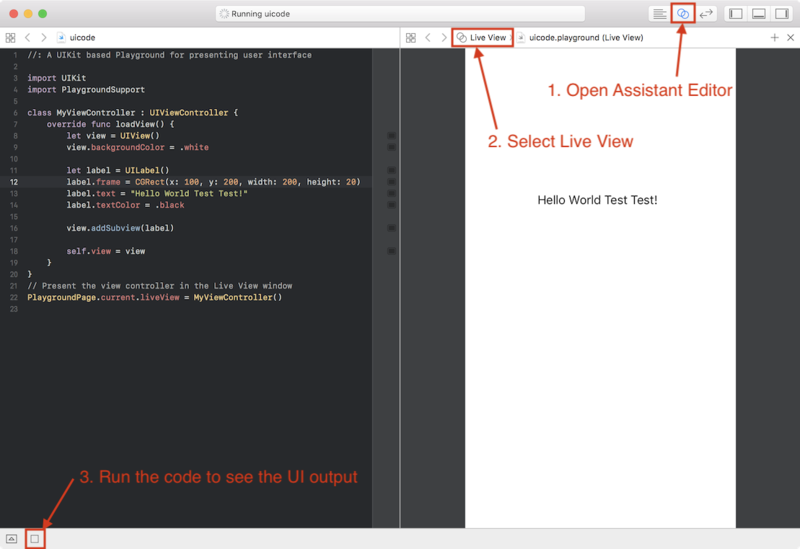 Since Xcode Playground doesn't have Interface Builder / Storyboard, you can only create UI using code. Now that you know how to create UI in code, you can experiment with UI in Playground! Playground let's you prototype UI quickly as you won't need to wait for the compilation of the whole project every time you run the code. To create UI in Playground, select Single View when creating a new Playground. We will explain more on how to create Auto Layout constraints for UI elements in code in part 2.